Note that the bottles are about 75% full. This is how we received from Al-Rehab factory. We reduced the price by 50%. 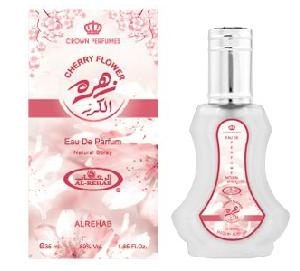 Cherry Flower by Al-Rehab is a Floral Green fragrance for women and men. Base Notes: Vetiver, Orris Root and White Musk. this is a very light scent. It's lightly floral and not overpowering. Yet it's feminine. I layer the spray with the roll-on. Sadly, with my body chemistry, the 'staying power' is a little less than I'd like.